El Mercadito, located on the first level on the right-hand side of Plaza Adelante, serves as an incubator for microbusinesses started by MEDA clients. 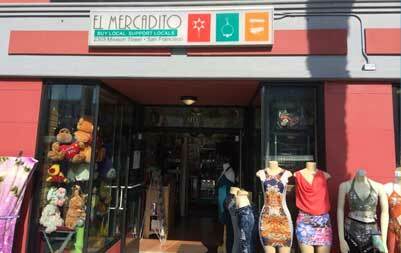 There are currently six small businesses in the Mission District El Mercadito, plus a popular Peruvian eatery in Plaza Adelante’s paseo. There is even a new Tenderloin El Mercadito, which currently features a café. All business owners went through MEDA’s free Business Development Program and later received one-on-one coaching. I am originally from Mexico City, where I lived the majority of my life. I had always worked independently, preferring that to working for someone else. When I came to the United States four-and-a-half years ago, I still wanted to run my own business. It suits my personality better. I m glad to be able to run my business in San Francisco, where my now family lives, as I love the city’s diversity. What did you learn at MEDA’s free Business Development Program? MEDA first taught me the importance of getting my personal finances in order. I then learned finances and accounting, including QuickBooks, plus social media and flyer creation for marketing. What were the main difficulties in starting a small business? There’s the bureaucracy, on a city and state level. Then there is getting the needed permits–that is always tricky. How did you get a business loan? That was through the Small Business Assistance Center (SBAC) in San Francisco. MEDA connected me to Martha Yanez, from Mayor Ed Lee’s Small Business Commission. She proved very helpful. It’s seasonal. At Christmas, I sell more perfume and makeup. For Mother’s Day, the Teddy bears are big sellers. Then it’s more sunblock in the warmer months. What is the biggest obstacle you face in running your business? It’s the language barrier. My English is not yet where I want it to be, so I am taking language immersion classes at City College. In terms of day-to-day operations, I draw on my persistence so that I just keep moving forward. Where do you see your business being in five years? I see myself in a bigger store with an expanded product line. It would be great to just manage the business and have employees. I also expect to be more involved in the community. Oh, and my English is going to be perfecto!